Those of you who have been reading these movie reviews for a while know that my favorite genre of movie is The Western. I love movies, period and I am the type of movie nut that will literally watch anything. Yes, even chick flicks. But westerns…man, that’s my huckleberry right there. Give me a Saturday afternoon, two or three good westerns to watch along with some cheeseburgers, potato chips and plenty of Coca-Cola and leave me alone. Now some of the recent efforts to make westerns haven’t been less than blockbuster but thankfully the remake of the classic 3:10 TO YUMA is a terrific movie. It’s not one of these “Revisionist” Westerns or a Western where the director is really trying to tell an allegory about Our Modern Times. It’s a horse opera, plain and simple. Told extremely well with outstanding performances by Russell Crowe and Christian Bale. 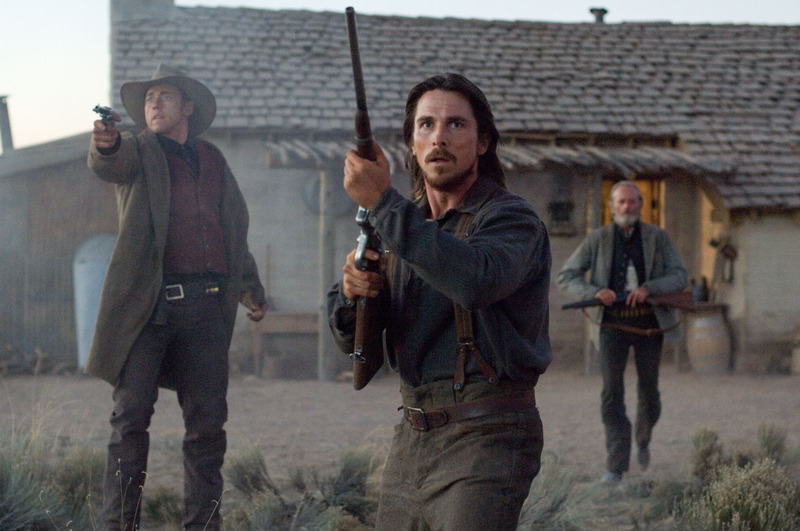 Dan Evans (Christian Bale) is a struggling Arizona farmer desperately trying to hold onto his land. He’s lost a lot already. Part of his leg was taken from him in The Civil War and he no longer has the respect of his oldest son William (Logan Lerman) or his wife Alice (Gretchen Mol). Dan is determined to hold onto his farm even though his water has been dammed up and his barn burned down by the local land baron. His chance to hold onto his land comes when the outlaw Ben Wade (Russell Crowe) is captured in the nearby town of Bisbee. Ben Wade and his gang have robbed the Southern Pacific Railroad 20 times and their representative Grayson Butterfield (Dallas Roberts) offers $200 dollars to any man who will help him take Wade to a town two days ride away where a prison train will take Wade to Yuma. Dan is eager to sign up along with Doc Potter (Alan Tudyk) the sheriff’s deputy (Kevin Durand) and bounty hunter Byron McElroy (Peter Fonda) who was the only survivor of Wade’s most recent robbery and would rather just as soon put a bullet in his brain than see him hang. The journey is not going to be an easy one. Dan and the others are pursued by Wade’s gang, led by the terrifyingly dangerous Charlie Prince (Ben Foster) Wade’s right-hand man who seems to take it as a personal insult that Dan and the other have even dared to presume to think they’re going to take Wade in to hang. And then Dan and the others have to take a detour through country infested with bloodthirsty Apache renegades. To make Dan’s situation even worse, his son William has taken it into his head to come along against Dan’s wishes as the 14 year old boy is plainly infatuated with Ben Wade’s legend. There are a lot of things that makes 3:10 TO YUMA work for me but I’ll give you the main three: One is the story. It’s a simple story, sure. But in Westerns it’s the simple stories that work the best. The motivations of the characters is the grease that makes the engine of the story run smoothly and everybody in this movie has a good reason for where they are and why they do what they do. Second are the performances. The actors in this movie all look as if they’re actually inhabiting the period they’re supposed to be living in. The problem with a lot of recent Westerns I’ve seen is that they’re miscast and the actors look as if they’re playing dress up. Not here. And three is the location shooting. 3:10 TO YUMA was filmed in New Mexico and it looks absolutely terrific. It has the look of vintage 1950’s/1960’s Westerns. The relationship between Dan Evans and Ben Wade is at the heart of this movie and both Christian Bale and Russell Crowe do splendid jobs of acting. Russell Crowe doesn’t play Ben Wade as a foaming-at-the-mouth-mad-dog killer. Wade is surprisingly intelligent, charming, educated, artistic and talented. In fact, he’s probably the smartest person in the movie and he has a scary insight into human nature. He can sit down with you for five minutes and tell you things about yourself you’ve kept shut up deep inside yourself for years. Dan Evans is nowhere near as smart or intelligent or talented. But he has a soul. A soul that intrigues Ben Wade and one he comes to respect. One of the best things about the movie is seeing how the relationship between the two men develops in ways I certainly didn’t see coming. Christian Bale is an actor that I think one day is going to achieve the status reserved for Brando and Olivier. He’s just that good. I don’t think I’ve ever seen him give a bad performance and I’ve followed his career since “Empire of The Sun”. I was really interested in seeing how he would handle himself in a Western and I enjoyed his performance a lot. He takes to the Western like a duck takes to water and I certainly hope he does more of them. 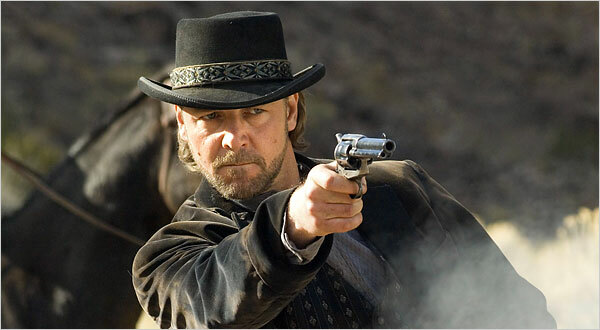 As for Russell Crowe, this isn’t his first Western. He did a great job in Sam Raimi’s “The Quick And The Dead’ and here he makes his Ben Wade a totally absorbing and interesting character, one that we watch just to see what he’ll do next because this is the type of guy who never does or says what you expect. The supporting cast does a fine job in the roles and I really liked Peter Fonda here. Peter has a lot of fun playing a tough-as-horsehide bounty hunter here. Fans of the TV show “Firefly” will want to keep an eye out for Alan Tudyk who plays a horse doctor who discovers he’s also a man of action. The action scenes are thrilling and just what I expect from a Western. There’s gunplay aplenty, especially during the last half hour of the movie where there are a number of plot twists that kept me on the edge of my seat. And I’ve said this about a number of recent movies but I’m going to say it again: much as I love CGI there’s some movies you don’t need it for and The Western is one of them. Sometimes it’s a pleasure to go see a movie where it’s Real People doing the stunts. 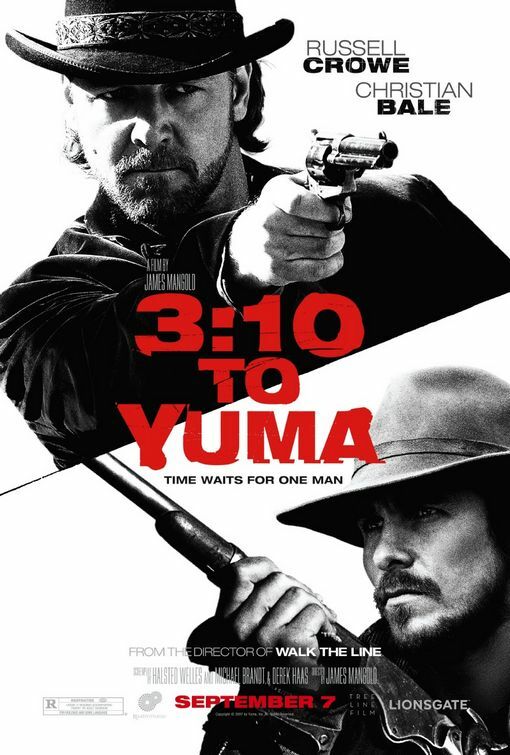 So should you see 3:10 TO YUMA? If you’re as big a Western fan as me, Hell, yes. Even if you’re not a Western fan and just want to see a movie with great action, solid acting and stunning cinematography, yes. If you’re a fan of Russell Crowe and Christian Bale, definitely. They give wonderfully strong, fully characterized performances here. 3:10 TO YUMA is well worth your time. I really enjoyed this one, too.